YORBA LINDA, Calif. – June 30, 2014 – Brandywine Homes started construction this month on Covington, a 5.1-acre urban infill community with 51 townhomes near Yorba Linda Boulevard and Blair Street, across from the Richard Nixon Presidential Library and Museum, in Yorba Linda, Calif. This project is scheduled to be completed by fall 2015. The approximately 1,750- to 2,100-square foot townhomes, designed by Theron Pate of Pate Smeall Architects, will incorporate craftsman elements into its elegant architecture, designed to blend with the surrounding neighborhoods. These luxury homes will include gourmet kitchens with granite countertops and stainless steel appliances. Residents will have access to common amenities including a recreation center, a community meeting room and a pool. Brandywine Homes is a residential homebuilder based in Irvine, Calif., that specializes in challenging infill development. Founded in 1994, the family-owned and operated company has built or developed almost 1,200 homes in 36 small- and mid-sized infill communities, revitalizing some of Southern California’s oldest and most established neighborhoods. Brandywine builds homes that respect and complement the heritage, values and architectural integrity of existing neighborhoods and the people who live there – making a positive contribution to the community. www.brandywine-homes.com. CoStar Group records indicate the complex, which is on 1.4 acres, was bought for $5 million. We turned an abandoned property into a beautiful, walkable community within the core of Garden Grove. In Stanton, we took what was once a blighted area and helped transform it into needed housing at a moderate price. In Cardiff-by-the-Sea, the need for housing in an environmentally sensitive area could only be achieved with the involvement of several agencies, including the California Coastal Commission, and involved homeowners. The public/private partnerships that we maintain in the communities where we build are at the heart of what we do. Infill development isn’t easy. In fact, other developers tend to run away from developments within cities, choosing instead to develop in the suburbs. At Brandywine, however, we relish the opportunity to work with local governments, environmental agencies, construction lenders and equity partners to address specific housing needs in established Southern California communities. Throughout the entire process — from land acquisition to plan development to the eventual construction — we are in communication with our partners, in order to ensure that the project goes smoothly. We don’t build homes that are out-of-character for the neighborhood they’re in, but we do breathe new life into aging areas. We don’t contribute to suburban sprawl, but we do utilize blighted areas and underused properties in order to provide beautiful, affordable places to live. And all of this is possible because of our commitment to building partnerships that include integrity, trust, resourcefulness, and innovation. For more information about the communities that we’ve developed throughout Southern California, or to find out how to partner with us, contact Brandywine Homes today. By the time that people buy an Orange county home and move from their old home into their new one, they’re so tired that they don’t have the energy it takes to decorate. Even hiring an interior decorator who’s going to be pottering around all the time seems like such a chore. As a result, they tend to just put the furniture where it seems convenient and leave boxes unopened for a while. After some time, it almost seems as though there’s no reason to move anything into a better position or buy new things for your home. You get used to seeing things a certain way and you forget that you ever meant to change anything! Before you move into the home, while it’s still bare, close your eyes and think about how you’d like it to look, ideally. This is the time to give your imagination free rein. Even if what you’re thinking about is outside your budget, don’t worry. You can always find a cost-effective replacement. Then write down exactly what you saw in your mind so that you can recall it when you go furniture shopping. And don’t forget to get the measurements of your new home either or you’ll end up with furniture that’s much too big or much too small. Visualizing your dream home is one thing. But you also have to be practical. You can’t buy things that aren’t going to fit or things that will get dirty too soon. White couches may seem like a great idea at first but as soon as your dog crawls up onto his favorite seat, you’ll regret your purchase. If you have kids, you might want to stay away from easily breakable pieces and light colors. At the same time, don’t get to be so practical that your interiors become boring. You have to strike the right balance. Contact us for more tips on interior decoration for your new home in Orange County. COSTA MESA, Calif. – June 16, 2014 – Brandywine Homes, a pioneer of infill development in Southern California, has acquired a 1.42-acre property in Costa Mesa and plans to build a 26-unit townhome community. 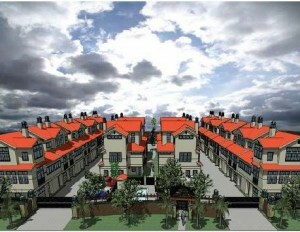 Demolition of the existing 18-unit apartment complex and construction of the new townhomes will begin immediately. This new townhome community is expected to be completed by Fall 2015, with the first homes becoming available for sale in February 2015. Brandywine Homes will offer two different floor plans for two-bedroom, two-and-a-half-bath townhomes with living spaces of 1,599 square feet and 1,727 square feet. All of the units, designed for cost efficiency and maximization of living space, will have attached garages. The property is located in a residential area with multifamily housing to the north, south and west and single-family residential to the east. Not checking the weather. Especially if you’re doing all the moving on your own or with some friends, you should remember to check the weather before you move. Try not to move on a really hot or a really cold day because this is going to be really exhausting for you. More than exhausting, it can also lead to health problems if you suffer from dehydration or frostbite. So try to move on a mild day, if possible. Even if you’re using movers, this will ensure that your work gets done faster because they won’t have to keep stopping for breaks. Not getting a big enough van. If you’re getting a van from U-Haul, go one size over what you think you need. Most people will give you an estimate of how big a van is required for a one-bedroom, two-bedroom etc. There’s no harm in having a little more space than is absolutely required. So just go with something a little bigger and save yourself the headache of making more trips than you have to. Carrying assembled furniture/equipment. Usually, when people have furniture that they’ve assembled themselves, they don’t want to take the trouble to disassemble it before carrying it to its new location. And this shouldn’t be necessary either. However, you might want to make sure that all the nuts and bolts have been tightened as much as possible before moving the piece. This will make sure that nothing comes lose along the way. Not padding glassware/stemware. When you’re moving glass items from your kitchen, you need to make sure that each piece is individually wrapped in newspaper or bubble wrap. It might be tempting to pack several plates together. After all, they fit into each other comfortably. But this can result in breakage, because the impact of lifting boxes and setting them down can cause the plates to bang against each other. For more information and moving tips, contact us. As reported this past spring, an analysis of communities in southeast Los Angeles County and northern Orange County revealed that the city of La Mirada experienced the lowest number of major crimes last year. Major crimes have decreased by 34 percent in the past year, the city explained. City officials credit the low crime rate to a well-working partnership between the La Mirada Public Safety Team and local law enforcement agencies, including the district attorney’s office and the Probation Department. The public safety team is proactive with its crime prevention efforts, the city explained, encouraging individuals to participate in the Neighborhood Watch program and offering programs such as the Positive Alternatives and Recreation for Kids (PARK) program. Brandywine Homes is pleased to offer La Mirada homes for sale at The Orchards, our 41-home infill community at the site of the former Alondra Center. Just as La Mirada works with partners to ensure a low crime rate for its residents, it also partnered with us to turn underutilized space into quality housing, and has given proof to the idea that things are better if you work together. For more information about The Orchards or any of our other fine communities in the region, contact us. See the bigger picture. For most people, buying a home is a big step which they don’t take lightly. So if you’ve decided to buy a home, you probably have a vision in your mind which involves your home, your family life, your career etc. You probably see your life in a certain way and buying a home is something that fits into that vision. So when you’re feeling bogged down by all the little things that need to be done, from applying for mortgages to packing all your stuff, think about the bigger picture. Think about how you and your family are going to eventually love your new home which is spacious, conveniently located and beautifully decorated. Just imagining the future can bring you a sense of peace in the present. Focus on each task fully. Of course, there’s something to be said for multi-tasking. There are times when you have to do more than one thing at a time. However, there are times when multi-tasking can leave your brain feeling really fried. Instead, make a list of everything that needs to be done and prioritize. Do the really important things first and focus on them when you’re doing them. Don’t jump from one thing to another. If something’s not that important, then it won’t matter if it has to get put off to another day. Delegate. When you’re buying a home and moving, you don’t have to do everything by yourself. Your family can help you out. So if you’re not able to finish a certain task, get your spouse to help you do it. Don’t feel guilty about asking for help. You wouldn’t do it if it weren’t necessary. There are many things with which your realtor can also help you, such as finding a lawyer, filling out the necessary paperwork etc. So don’t be afraid to reach out to him/her either. And if moving everything is too much of a chore, you can always hire movers. So take help no matter where it comes from. These are a few things to keep in mind when buying a home and moving into it. Contact us for more tips to make your life easier in this process of transition.